Written and published by the Yucaipa Valley Historical Society in 2004. Soft cover 30 pages. Available from the publisher for $20. The reviewer has occasionally driven by the Crafton Hills on his way to the nearby apple orchards at Oak Glen or to bag a peak or two on Yucaipa Ridge little realizing it contained many old gold mines. Mining started by 1839 with most of the mines dating from the 1880’s and 90’s. Supposedly there are about 80 mine openings in the area but the numerous pictures indicate that most are exploratory digs; aka “gopher holes” less than 10 feet long. The length of only one mine is given (75 feet). The area is owned by the BLM with portions leased to several public agencies. The Crafton Hills portion of the Yucaipa topo is attached and the names and location of many of the main mines are inserted. The histories of many of the mines are also included. The Yucaipa Valley Historical Society deserves much credit for publishing for the first time information on these mines that have been unknown to the general public. Society, P.O. 297, Yucaipa, Ca. 92399 (909) 790-3777. It is $20 by mail or $16 if purchased at the Society’s office. Written by Jim Hanna (great grandson of John Muir) published 1990 by Gold Hill Publishing Co., Virginia City, Nevada. Paperback 56 pages, $10. The reviewer purchased a copy at the Lundy Lake Resort. The paved road to Lundy Lake starts 8 miles north of Lee Vining, off of Highway 395, and goes west for 4 miles ending at the lake. Most visitors come for fishing or camping in this high elevation recreation area just east of Yosemite national park. However, the reviewer’s interest was in the extensive mining in Lundy Canyon mainly for gold, performed off and on from 1879 to 1934. The author obviously has a deep interest in this mining (his father owned the biggest mine) and gives detailed instructions on how to reach the 12 major mines. 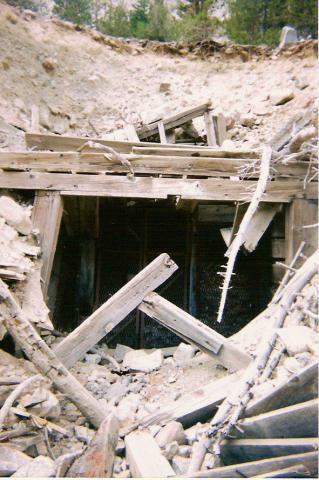 The reviewer’s trip in September 2003 was to the lower tunnel of the biggest mine, the May Lundy (elevation 9,600’), about a 3-mile hike from the Lakes Canyon trail head at the dam. I was disappointed to find it was gated (something not mentioned in the guide book). 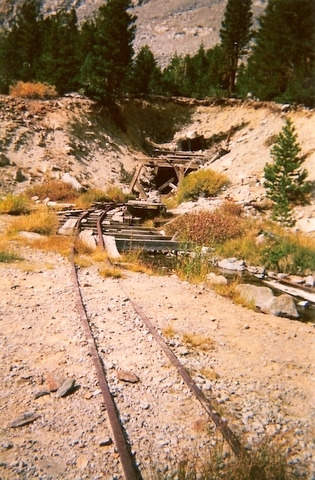 Below the mine entrance and above Lake Crystal are ore cart rails and collapsed mining structures. The mine reportedly consists of 3 tunnels ranging in length from 115 to 1,100 feet. Part of the hill behind the gate has collapsed leaving open a possible entry, but being alone and without rope, I was not about to attempt it.